Nizar Jarjour, MD, Senior Vice President, Chief Academic Integration Officer for UW Health and President of the UW Medical Foundation. Dr. Jarjour's clinical activities include staffing the outpatient pulmonary clinic and directing the pulmonary diagnostics laboratory. 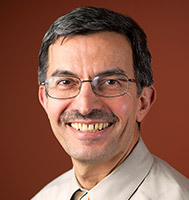 Dr. Jarjour's research program include mechanisms of allergic inflammation, role of eosinophil in airway disease, pathogenesis of viral induced asthma exacerbations, etiology and characteristics of severe asthma, mechanisms of action of anti-asthma medication, airway remodeling and clinical aspects of asthma.